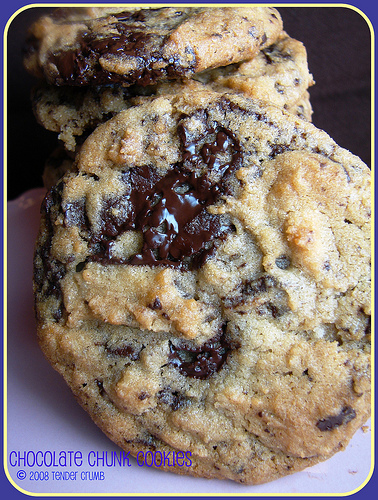 You just can't go wrong with a classic chocolate chip cookie. I would have to say it's my favorite dessert of all time. When it comes to the classic dessert, I've always been a Tollhouse girl. UNTIL NOW! Don't get me wrong, I'd be happy as a clam if Tollhouse was the only chocolate chip cookie I was ever able to consume again. BUT, when my best friend Kalle introduced me to a different chocolate chip recipe that simply blew me away, my world was opened up. There's life beyond Tollhouse...you have to make it to believe it! Kalle found this HERE from Tender Crumb's blog. It comes from famous chocolatier Jacque Torres and it's supposed to be a secret. Whoops! Guess the secret's out! Per Tender Crumb's recommendation, we put the dough in the fridge for 24 hours before baking. The cookies came out so freaking delicious that I am afraid to NOT put the dough in the fridge for 24 hours. Plan ahead and DO IT! We used Ghiardelli semi-sweet chocolate chips, and almost 2 bags. The more chocolate the better. 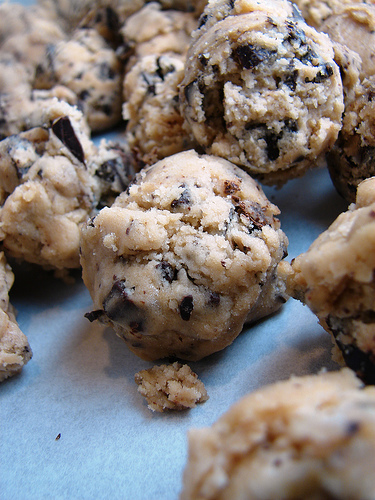 This recipe makes a TON of cookie dough. In fact, it was almost comical to see it swishing around the mixer considering it definitely didn't fit in all at once. Yes, you can cut the recipe in half, but you might as well just make the whole batch and freeze the rest for later. The cookies are also pretty large. So one or two (or 7) will be enough to satisfy you at a time. Yes, you have to buy pastry flour and bread flour for this recipe. I'm going to need you to just do it. It's worth it. Be safe everyone on the East Coast - Hurricane Irene is on the way! 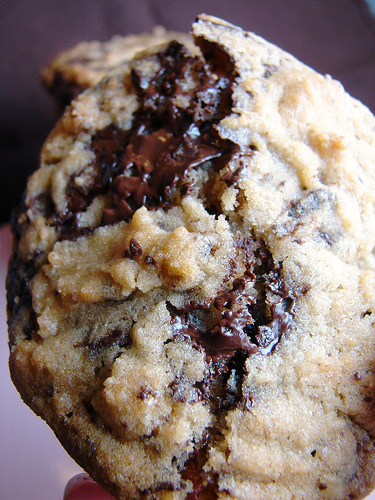 Do you use an ice cream scoop for your cookies? They look beyond yummy! Can't wait to try the recipe! Mmmmm...chocolate chip cookies are THE BEST! This looks like the perfect way to spend the upcoming rainy weekend! I must say that every chocolate chip cookie I have made for the last 5 years always came out flat and the taste was ooookaay... But today I tried out his recipe for my son's christmas party at school and these were not only the best on'e I have ever made but the kids in his class said that they were the best cookies even better than their mommies...LOL Thank you!! This really looks delicious. I'm definitely craving for a plate of that right now. Thanks for sharing this wonderful recipe. This is definitely a must do recipe this weekend since I got my Food Handler Certification.